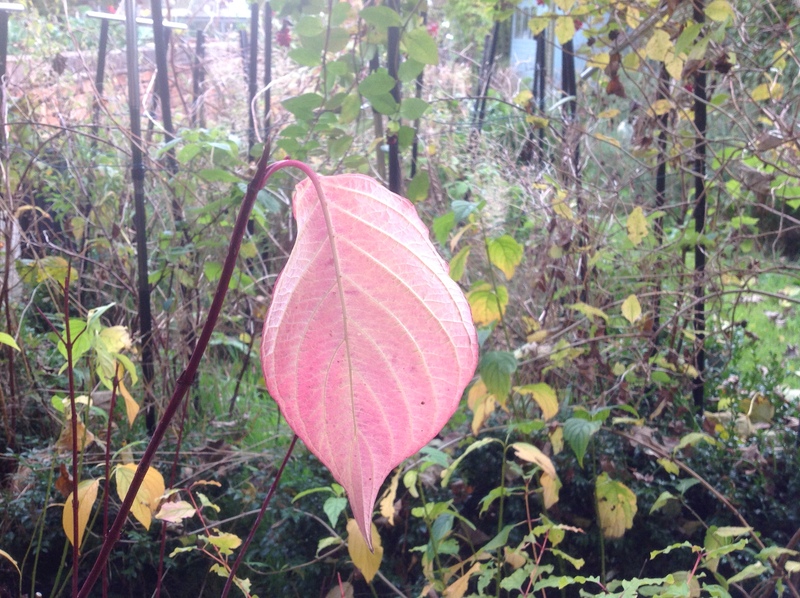 October Foliage – All the Colours of the Rainbow! This entry was posted in Uncategorized and tagged Cornus, Cotinus, Foliage, Fothergilla, Pittosporum, Prunus, Trachelospermum, Wisteria on October 27, 2015 by thelonggardenpath. The highlight of any garden – maybe even the ultimate aim – is the combination of plants, and the effects they create. What a feeling, when what you envisaged and planned for, comes to fruition! Or, even more exciting, when a perfect plant combination comes out of the blue. Sitting out the other night, enjoying a bit of lovely evening warmth, I looked more closely at the adjacent Black border, and thought “You know, that grass, now it’s flowering, is perfect next to that Astrantia!” The grass was a later addition to the bed, and hadn’t proved itself, up to that point. Mind you, it does need staking – the effect is totally ruined if it flops, as it tends to do. I really wanted to share this, and then went on a walk around the “Estate” to see if there were any other possible contributions. 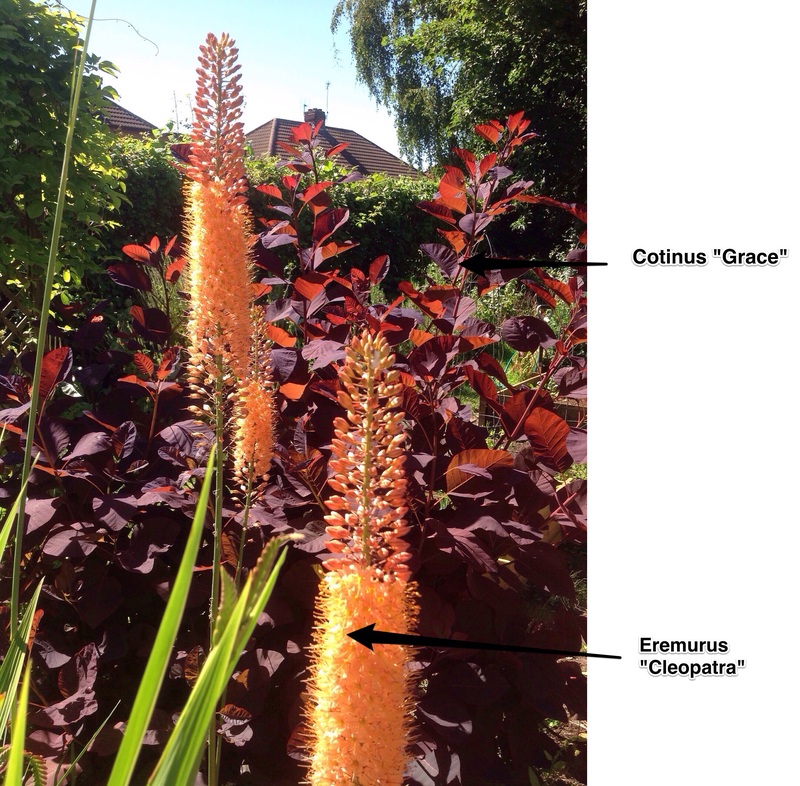 Thanks to the joys of iPad, I have now learnt how to annotate my photos, and show you, so easily now, what the plants are. Modern technology, eh? And here’s one I made earlier! I hope to continue this theme, as and when these horticultural pairings arise. The photos, once annotated, are self explanatory, so these posts may be short and sweet, even wordless, but always impromptu. 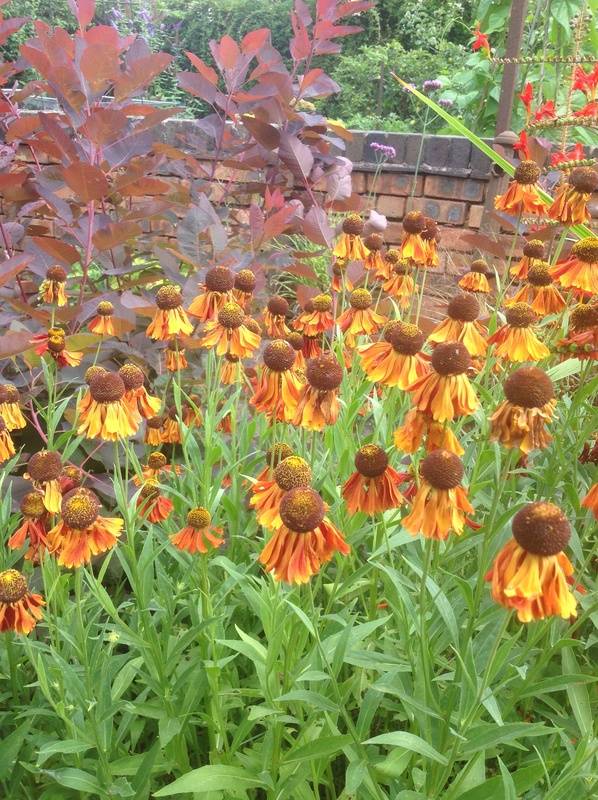 What wonderful and exciting plant combinations do you have in your garden? It would be lovely if you could share them with us. I, for one, would love to see them! 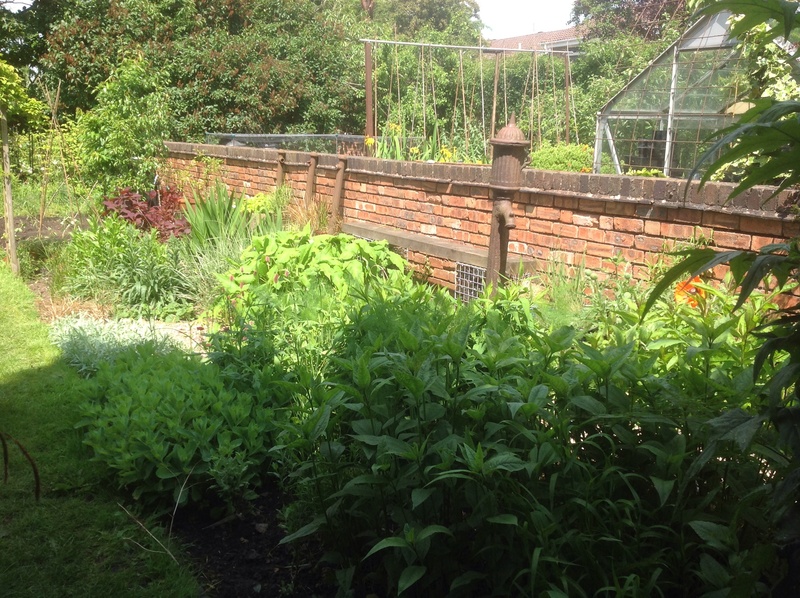 Gardening is all about learning, and what better way to learn, than from fellow gardeners? This entry was posted in Perfect Plant Partners and tagged astrantia, Carex, Cotinus, Deutzia, Digitalis, Eremurus, Melica, Plant combinations, Rosa rubrifolia on July 2, 2015 by thelonggardenpath. Boy, is it cold today! Takes us all by surprise! A pleasant one, however, after this wet and weary spell. Well, my first choice of title, was to be “A Touch of Frost”, but it had already been used. But a touch of frost is what this post is all about. 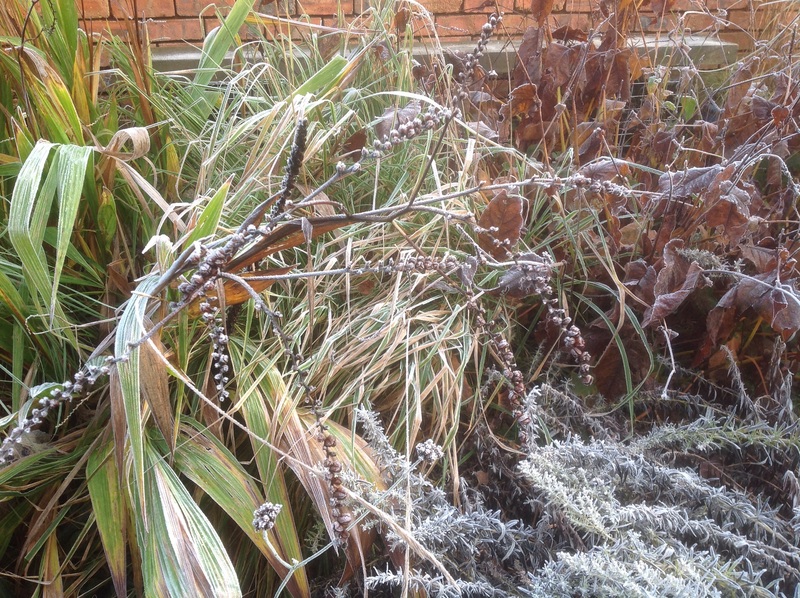 How wonderful is the first real winter frost! It transforms the garden from a dull, mushy brown to a winter wonderland. It defines all the leaf edges and foliage detail, with crisp whiteness. This is when you pat yourself on the back for including all the grasses, and structural plants. 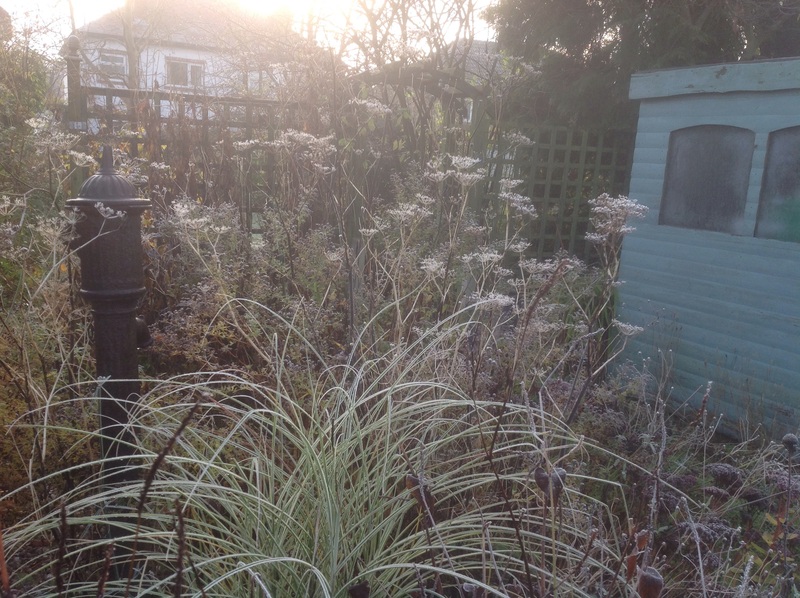 In the Grass Garden, the silvery Miscanthus grass, “Morning Light”, becomes even more silvery, set against the backdrop of frosted fennel seed heads. Even the functional Allotment, takes on a picturesque quality. 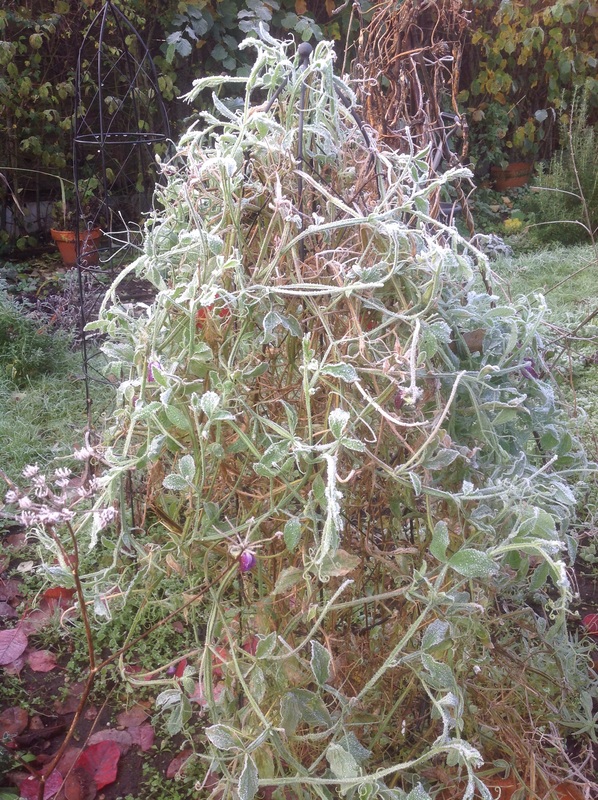 The last of the sweet pea flowers twinkle out of its frosted tepee, looking somewhat like an early Christmas tree! 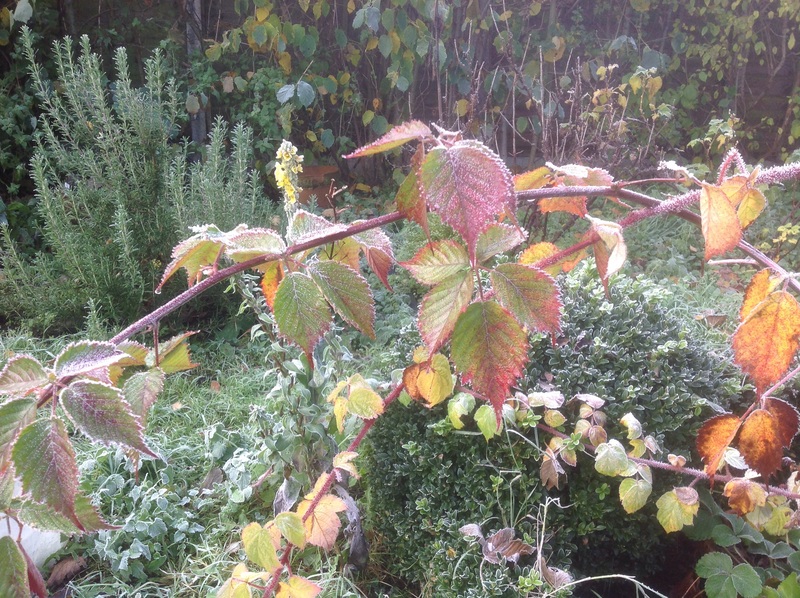 The wayward stems of the Japanese Wineberry, still with its autumn coloured leaves, are now edged with white. And the frost outlines the box balls, accentuating their crisp, structural qualities. 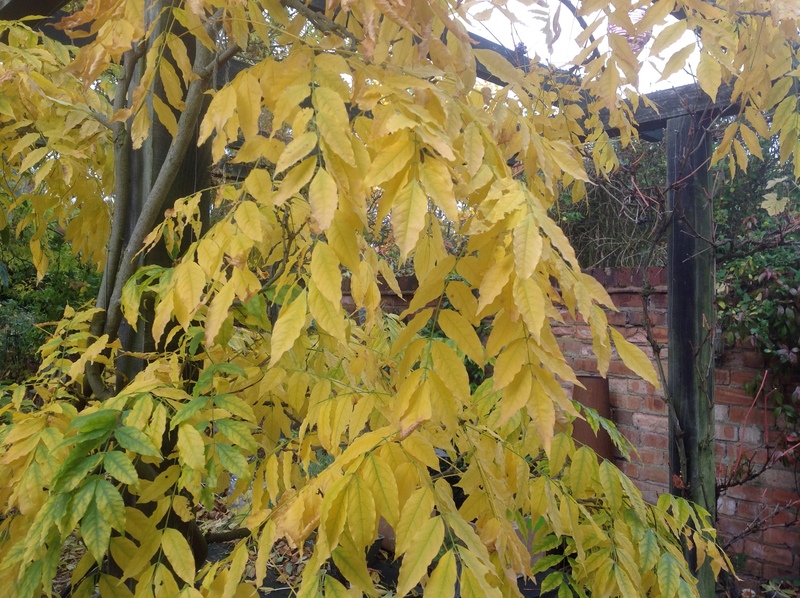 Elsewhere, in the garden, the frost picks out the scented shrubs, giving the Mahonia japonica, just starting to flower, the appearance of a sparkling star. 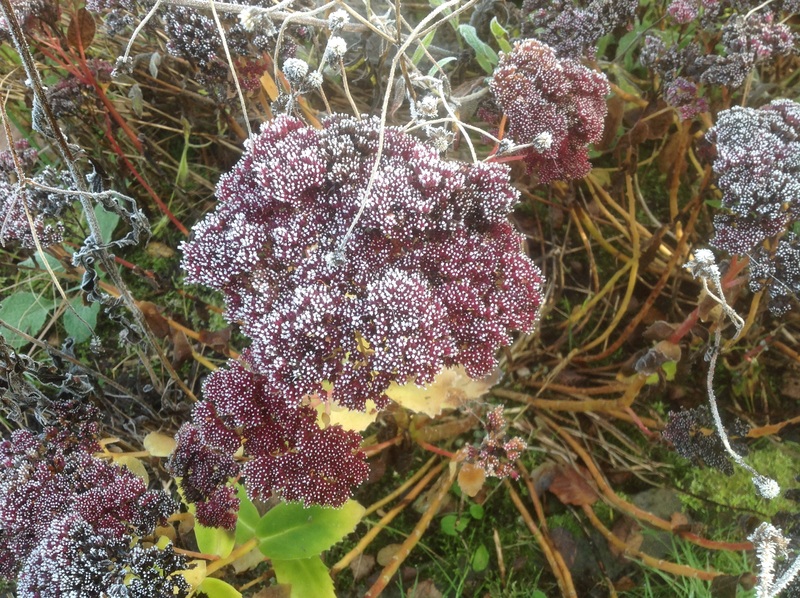 Most of the flowers are now long gone, but the raspberry flower heads of the sedum, looks like fruits that have been dusted with icing sugar. And talking of raspberry tones…. 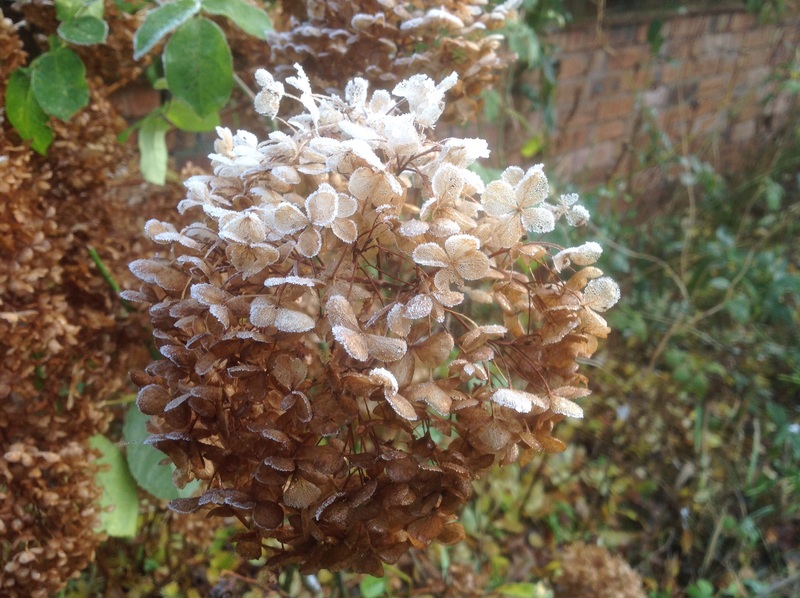 ….isn’t the last of Grace’s leaves, stunning etched in white? Despite the sterling work done this year by our lovely “Annabelle”, she is still looking wonderful in her old age. As the song says “Silver threads among the gold”. If this is what winter has in store, then bring it on! 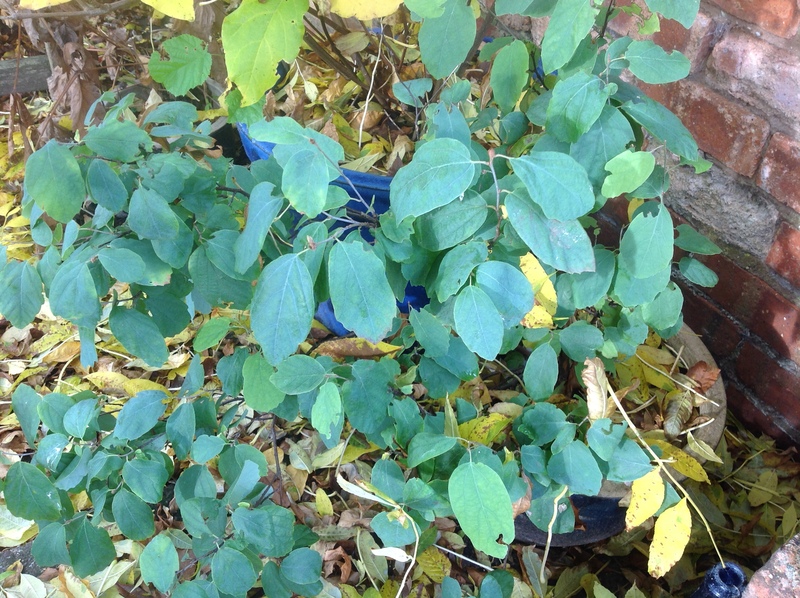 This entry was posted in Uncategorized and tagged Allotment, Box balls, Cotinus, Grass Garden, grasses, Hydrangea "Annabelle", Japanese wineberry, Mahonia japonica, Sedum, sweet peas on November 25, 2014 by thelonggardenpath. We’ve now had our first frost, so that’s it! I know summer has been hanging on for as long she could, but we can’t deny any longer that autumn is well and truly here and heading towards winter. Please don’t think of me as a merchant of doom! 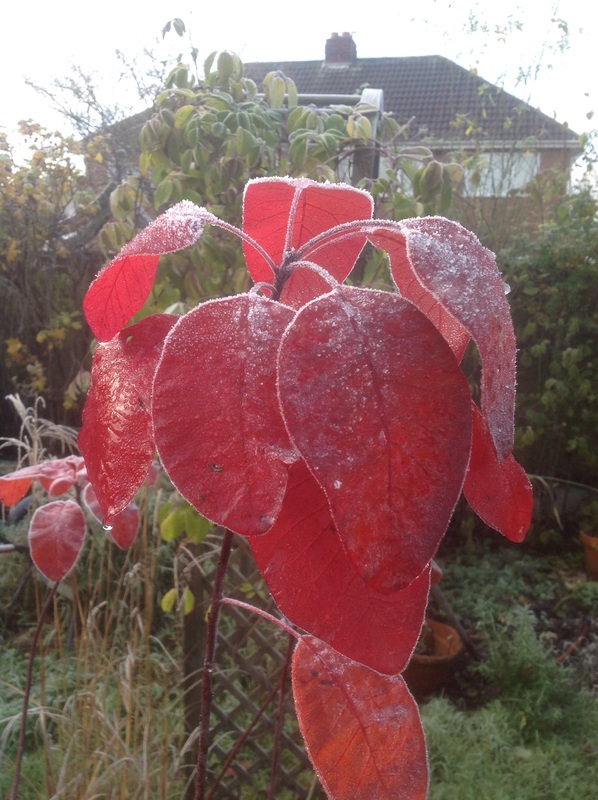 On the contrary, autumn and winter are just as beautiful, with magnificent fiery leaf displays and frosted skeletons. So much to enjoy! But I do miss being able to spend as much time outdoors. This realisation was re-enforced on my recent walk around the “Estate”, while idling along the scented shrub border. 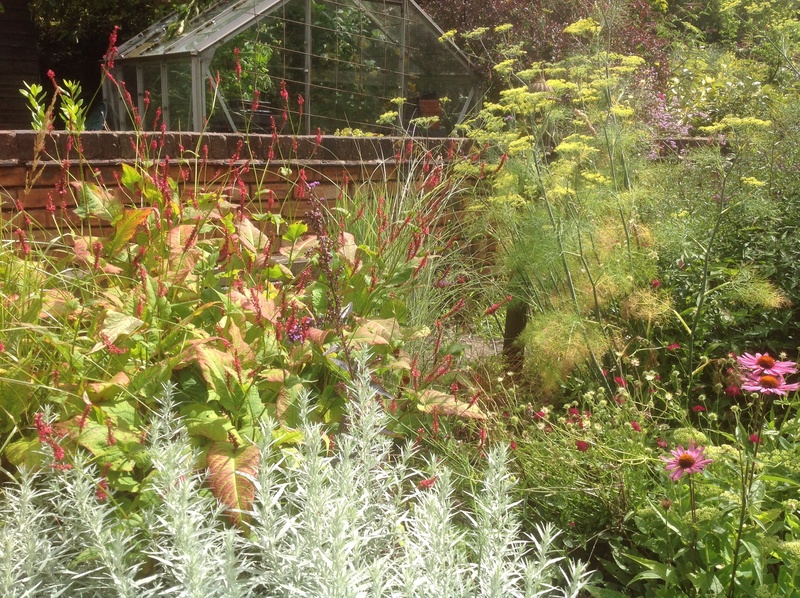 After the flowers of summer and leaves of autumn, this border starts to take on greater importance again. Some of our winter flowering shrubs, are already starting to flower, although one of our summer shrubs is still bravely soldiering on. I was amazed to notice quite of a few of its lily-of-the valley flowers still nestling among its glaucous leaves. Its aniseed scent was, sadly, not so obvious. 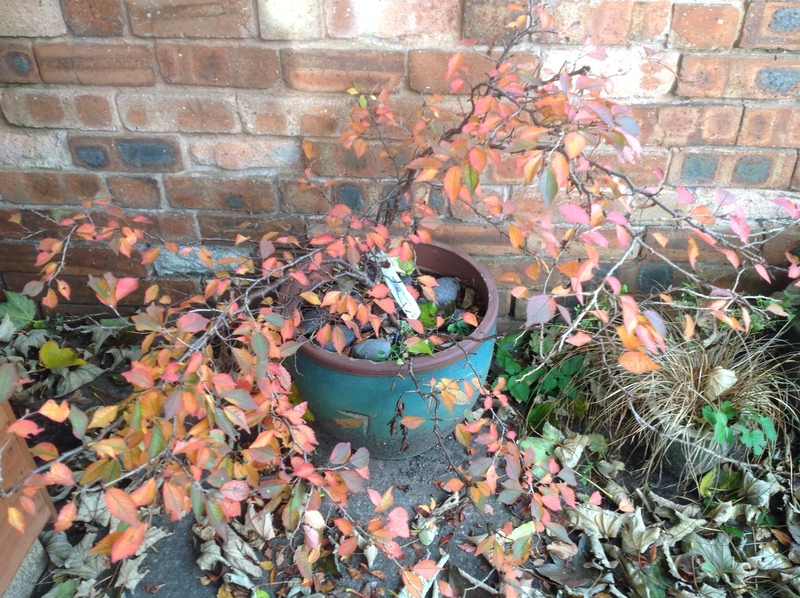 But the main shrub border is definitely showing a wintery trend. Viburnum is a stalwart of the winter garden, especially where scent is an issue. V. farreri is a large, sprawling, deciduous shrub, lovely at this time of year, when it starts flowering, coinciding with the last of the reddish tinted leaves. The clusters of tiny, white flowers, like miniature “cottonwool balls”, sporadically appear over the shrub throughout winter. This one started in October. The flowers, although small, emit a sweet scent reminiscent of baby powder! In the flowering hedge, in the front garden, we have another example, the well known Viburnum x bodnantense “Dawn”. 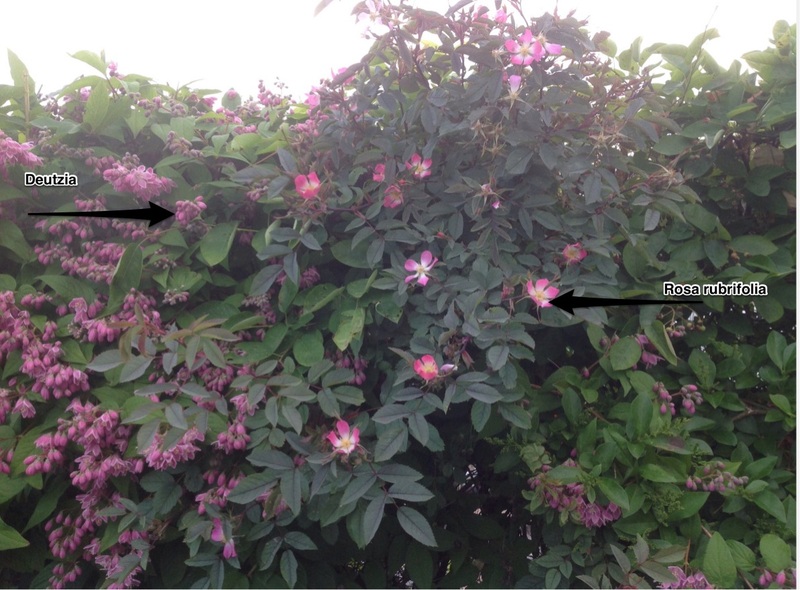 It’s a very similar shrub, the flowers being more pink. Here, the blooms are somewhat lost in the mass of dense foliage, but the powdery scent definitely is not! Back in the Scented Shrub border, Skimmia japonica “Rubella” is revving into gear, providing colour with its ruby-red flower buds. It’s not, as yet, treating us to any of its sweet perfume – that, it’s saving up for spring. 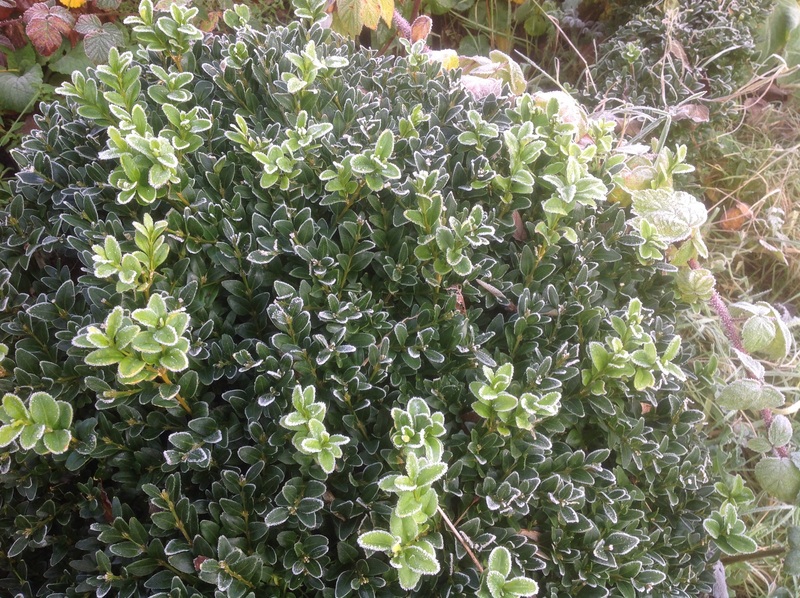 This small, evergreen shrub, another winter favourite, courtesy of its flower buds, needs little introduction. I’d go so far as to say it’s the buds rather than the scented flowers, that makes this such a favourite for winter, being widely used as a component in winter pots. Moving on, and this is where we almost come full circle. 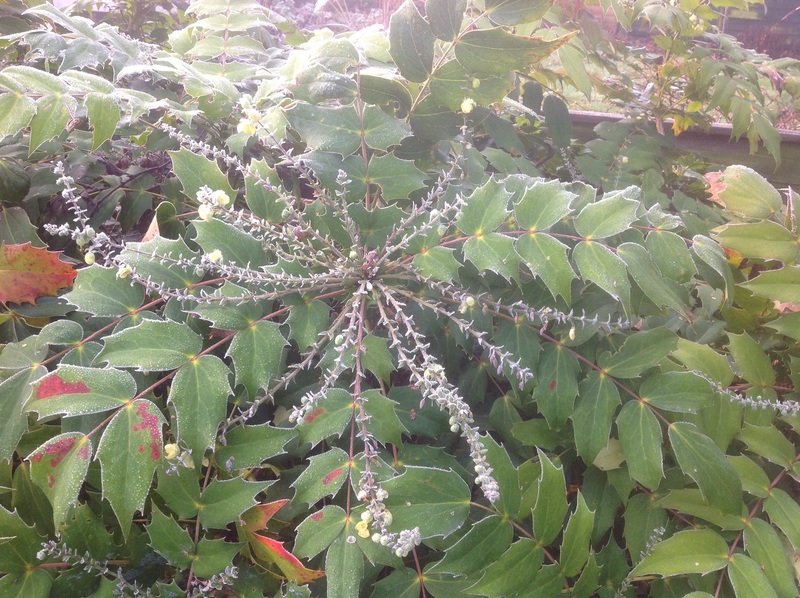 The Mahonia japonica’s sprays of flowers, are just starting to open. And it’s beautiful, tiny daffodil blooms, perfumed like lily-of-the-valley, was the first subject I wrote about, way back at the start of the year! ….our Coronilla has started flowering again, having only stopped blooming in early summer. How’s that for longevity! But despite the promises of winter scent, let’s carry on enjoying autumn, with the burnt orange tones of Cotinus, glowing in the sun, at the start of the post, to another “Stolen Pleasure” of pink forsythia leaves in combination with flowering ivy, at the end. This entry was posted in The Scented Path and tagged Coronilla, Cotinus, forsythia, Ivy, Mahonia, Scented shrubs, Skimmia, Viburnum, Zenobia on November 4, 2014 by thelonggardenpath. The Cottage border has now done its thing, and is looking a bit flat and tired out. Even the brave attempts by the Leucanthemum daisies, are now looking a bit half hearted. But all is not over yet. Travel through the archway, and you’ll find our Grass garden, a border of grasses and hot coloured prairie style planting, that happens to flower later in the summer, providing a well received injection of colour. You’ve had glimpses of it in the past, but now is the time to show you in detail. 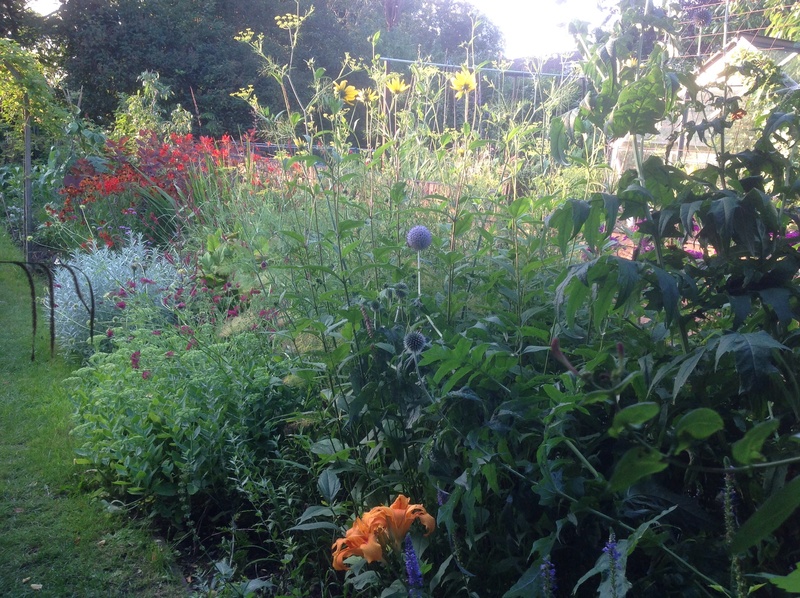 This was the border, as we saw it from the archway, way back in June, when it was just filling out. It’s looking nice and “tidy” (a word I hate when applied to the garden!) at this time, and you can make out the basic layout. It’s a border about 30ft long by 6ft wide, bounded by two paths – the long central grass path, and a concrete/slab path, that originally ran the length of the garden by the garden wall. The slabs had been removed from the top half of the garden, right at the start, to create our cottage border, but the solid concrete path remained, and has now been incorporated into the gardens designs, as an alternative route round the garden. A gravel path links the concrete path to the Cottage Garden beyond the trellis fence, and has been continued to cut through the Grass border. As the border is so long, with paths either side, I thought it would be nice to link the two paths, creating a path through the planting, to “get up close and personal” with the plants, in particular the oh so tactile grasses. In actual fact, at this time of the summer, it is probably a bit too “close and personal”! More like cutting through the undergrowth – not an easy route! You can also make out our homemade bench. Two metal gabions, filled with empty wine bottles, and a scaffolding plank across the top. We had fun making that! It’s a lovely, hot sunny spot to sit in, in good weather (with a glass of wine, of course!) Several rusty artefacts have also found their way there, their colouring blending in well with the colour scheme here. The border is, in actual fact, a combination of three colour-themed borders, merged together. Firstly, the Chocolate-orange border is the one furthest away in the photo. 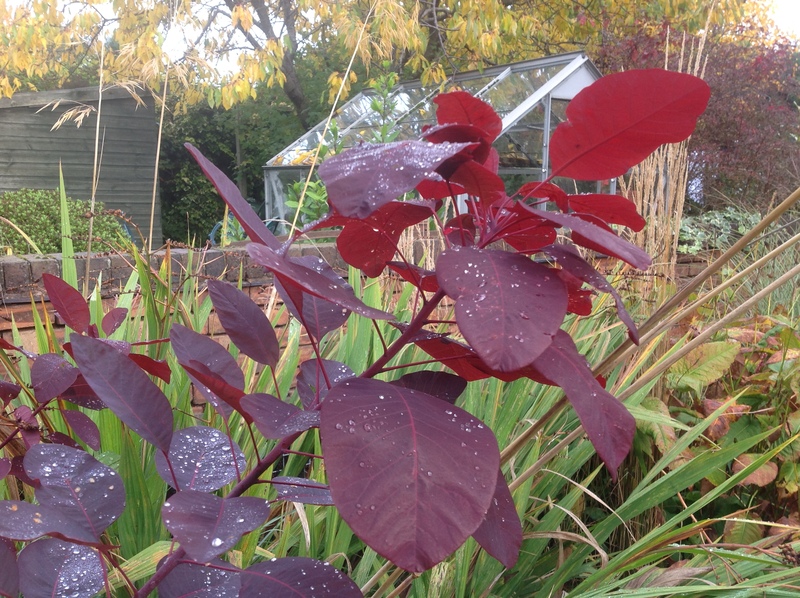 The border is backed by the shrub, Cotinus “Grace”, with its gorgeous, chocolatey leaves. It needs to be hard pruned every spring to maintain its size, as it can grow quite large, but this way it produces improved leaves. 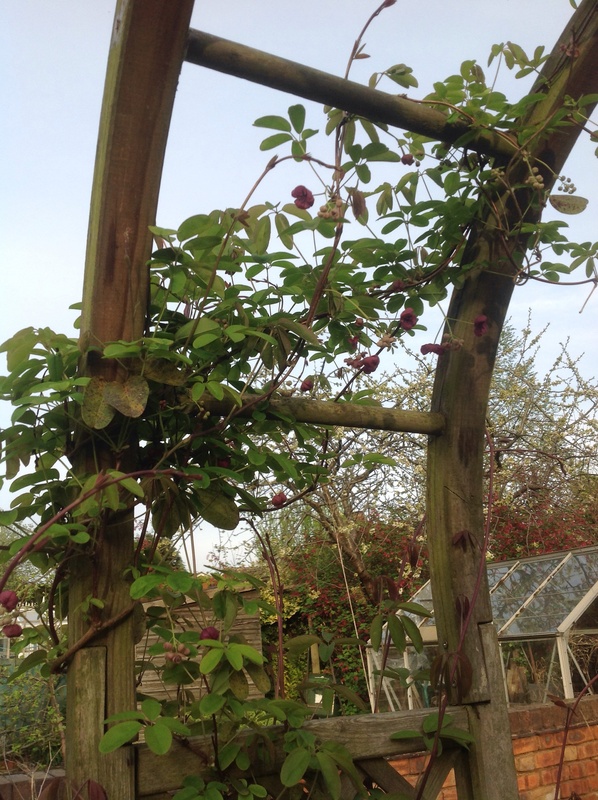 Akebia quinata, the chocolate vine, clambers over the archway. The orange flowers here are Helenium “Moorheim Beauty”, and the remnants of flowers and seed heads of Crocosmia “Lucifer”. The spires you see, are the dead flower spikes of Digitalis parvifola. 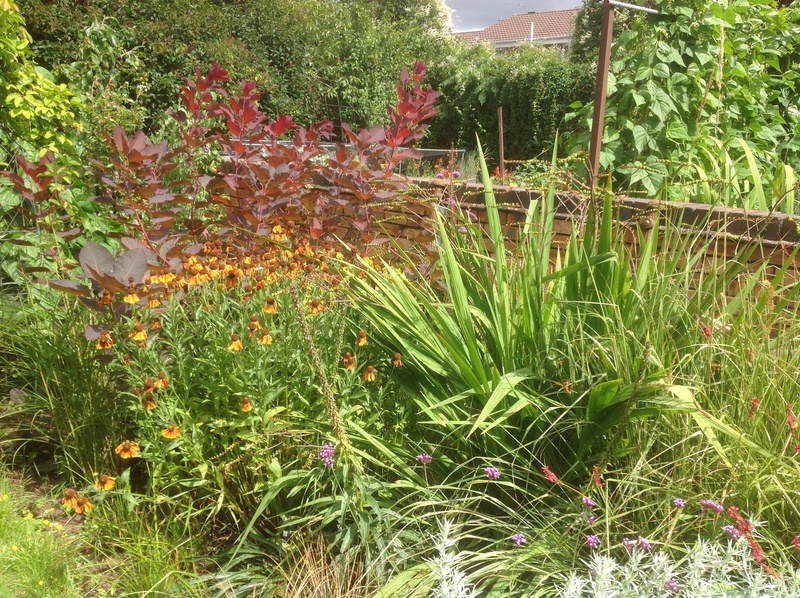 Geums and Kniphofia continue providing more orange elements. The grasses here are Stipa gigantea, the bronze Carex buchananii and Miscanthus “Ferner Osten”, with its wonderful chocolate/wine plumes. The central section is the Wine border. 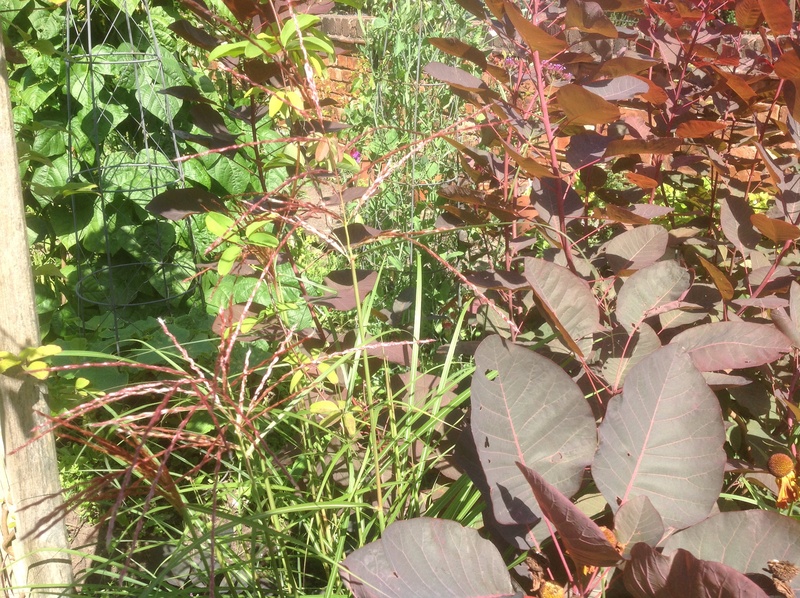 Here, the colour scheme is of deep winey reds, with Persicaria amplexicaulis “Firetail”, Sedum, Knautia macedonia, Sanguisorba menziesii and the annual self-seeder, Atriplex hortensis rubra all set off with the silver Artemisia ludoviciana, and pink Echinacea purpurea. 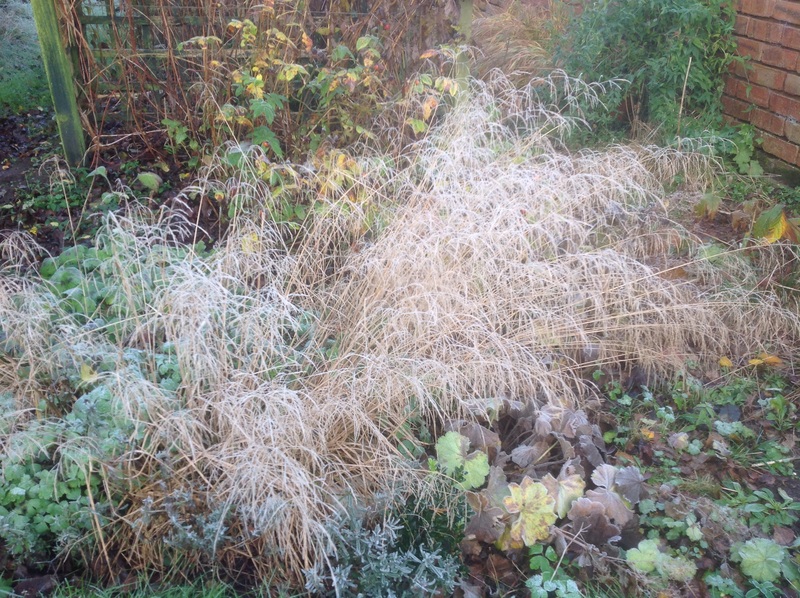 The grasses here are the upright Calamagrostis “Overdam”, the ethereal Molinia “Transparent” and the silvery fountain that is Miscanthus “Morning Light”. The Grass Border finishes (or starts, depending on how you look at it!) with the Gold border, in shades of golden yellow contrasting with blues and purples. The gold is provided mainly by the flowers of Fennel and of an unknown perennial Helianthus. At the back of the border, the steely blue orbs of globe thistle, Echinops ritro, tower over 6 ft tall. Thalictrum delavayi, with its lilac froth of flowers blends well with the fennel, creating a very hazy scene, punctuated by spots of purple provided by Phlox “Nicky”. Aster x frikartii “Monch”, is yet to add its lilac flowers to the froth. Elsewhere, there are the blue spires of Perovskia, Veronica, and, earlier, Salvia, with added gold shades from an orange Hemerocallis. Another Calamagrostis, the green “Karl Foerster”, repeats the punctuation provided by the previous silver edged “Overdam” and, sadly, a Melica Atropurpurea, with its beautiful purple plumes, struggles to break through. You may also have noticed popping up, the purple flower heads of Verbena bonariensis, allowed to self seed throughout the whole border, its repetition linking the three borders together. And when this border has finished its flowering, it’s still not over. Flowers have been chosen, that have interesting seed heads and shapes, to remain with the dead grasses, giving texture and interest into autumn, and hopefully winter, when frost creates yet another beautiful picture. There you have it! A riot of colour! Hope you like it! 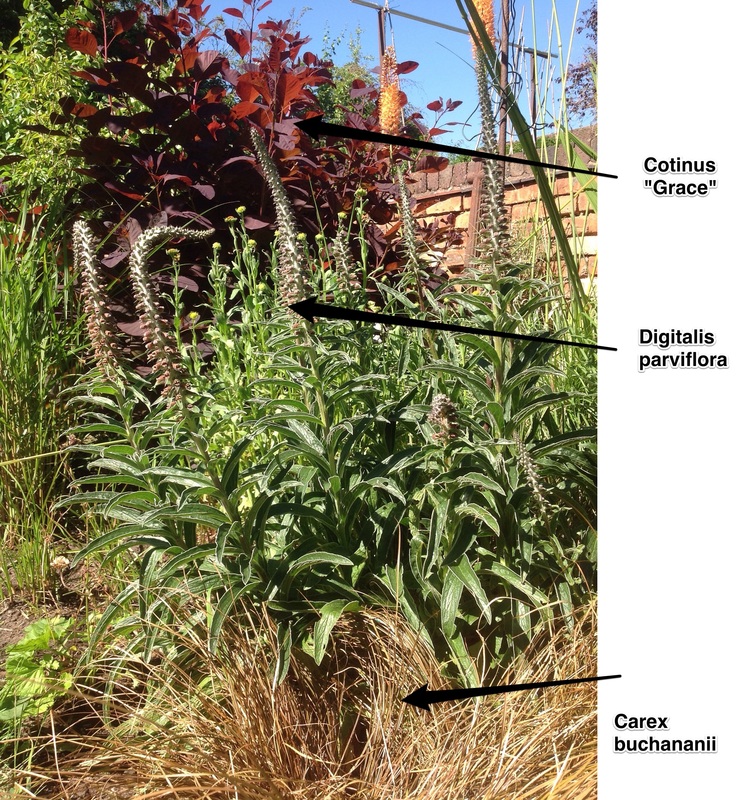 This entry was posted in Uncategorized and tagged Artemisia, Cotinus, Crocosmia "Lucifer", Echinacea, Echinops, Fennel, Grass border, grasses, Helenium, Helianthus, Knautia, Persicaria, Phlox, Prairie-style planting, Thalictrum on August 19, 2014 by thelonggardenpath. It’s a wet Sunday afternoon. Nothing much can be done outside – at least with any comfort. So I’m amusing myself, playing around with some of my photos and practicing a new collage app. Rachel de Thame, on the t.v. coverage of Chelsea Flower Show, did a series of articles, on themed plant collections, one of which was chocolate. 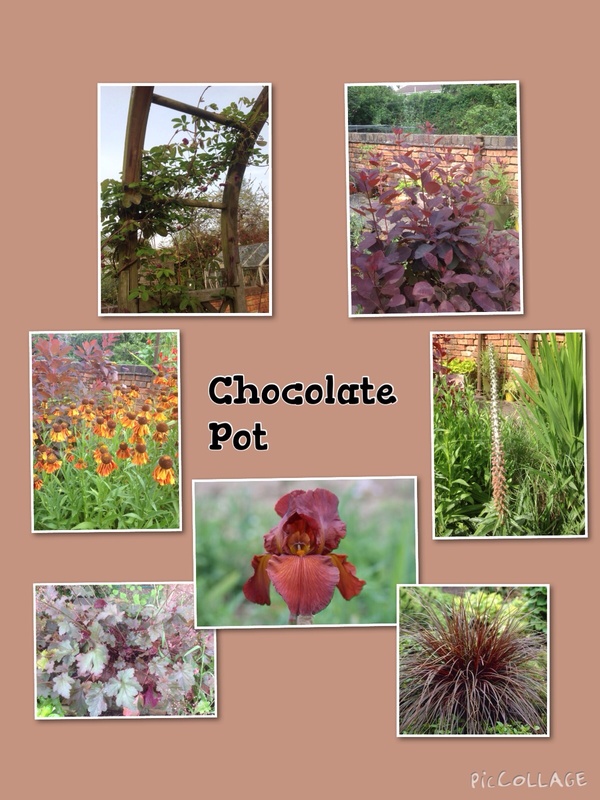 For a bit of fun, I thought I’d create my own “Chocolate Pot”, using plants in our garden. 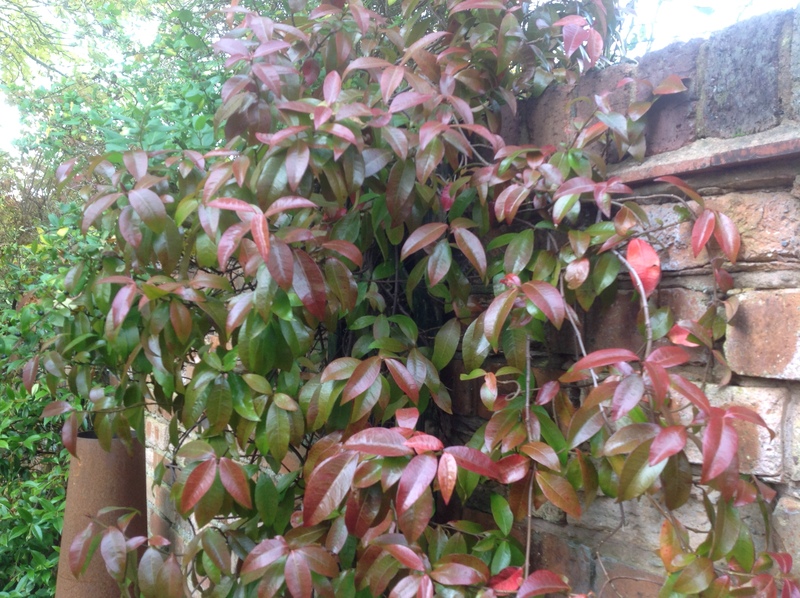 Let’s start with a climber, to cover the back fence or wall. Akebia quinata, or “Chocolate vine”, is a beautiful climber, with chocolate coloured flowers, that smell of vanilla, in spring. 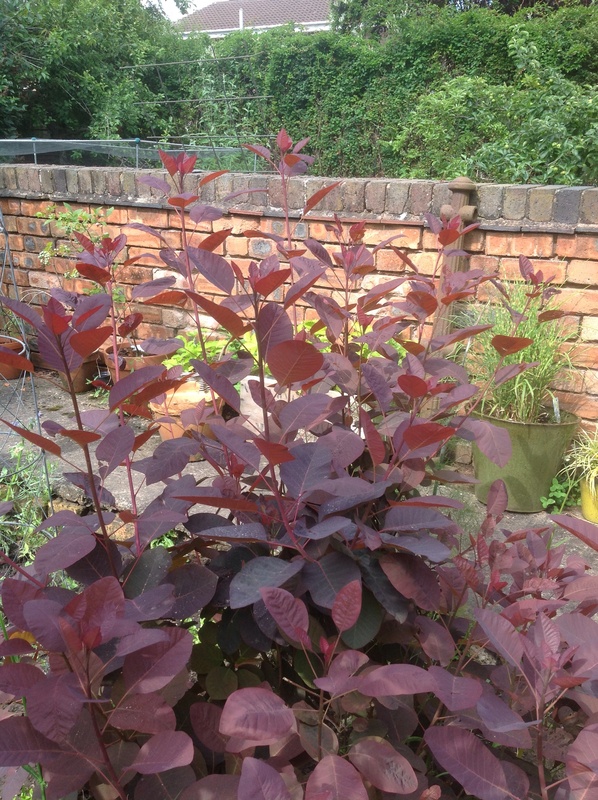 Next, we need a backdrop to the border, so we have Cotinus “Grace”, with its beautiful oval, chocolate coloured leaves. 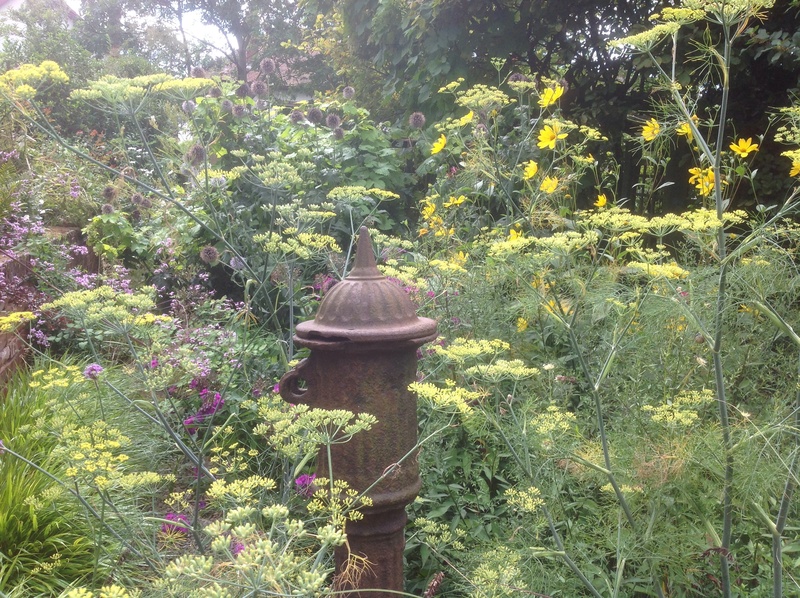 Now for the highlights of the border – the flowers. 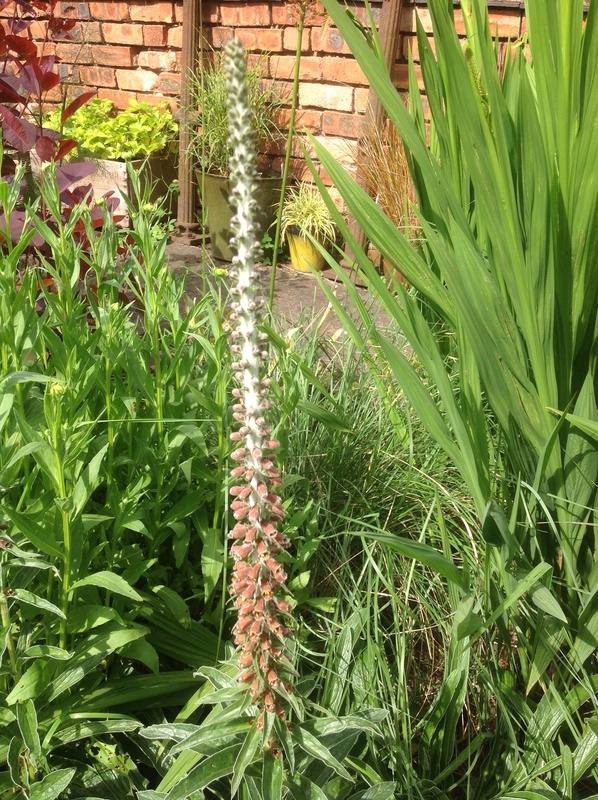 The “Chocolate foxglove” gives us fantastic spires of chocolate coloured flowers. 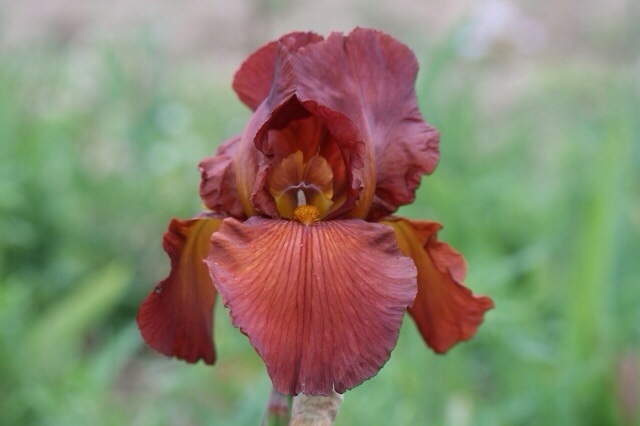 Irises always give us stunning flowers, as well as interesting foliage the rest of the time. “Dutch Chocolate” is no exception. We now need a flower to brighten up these chocolate tones, so I’ve introduced a “chocolate orange” element in the form of this orange daisy with chocolate centres. This daisy is a good filler providing a contrast in flower shape. And now, to finish it all off, we need an edging. 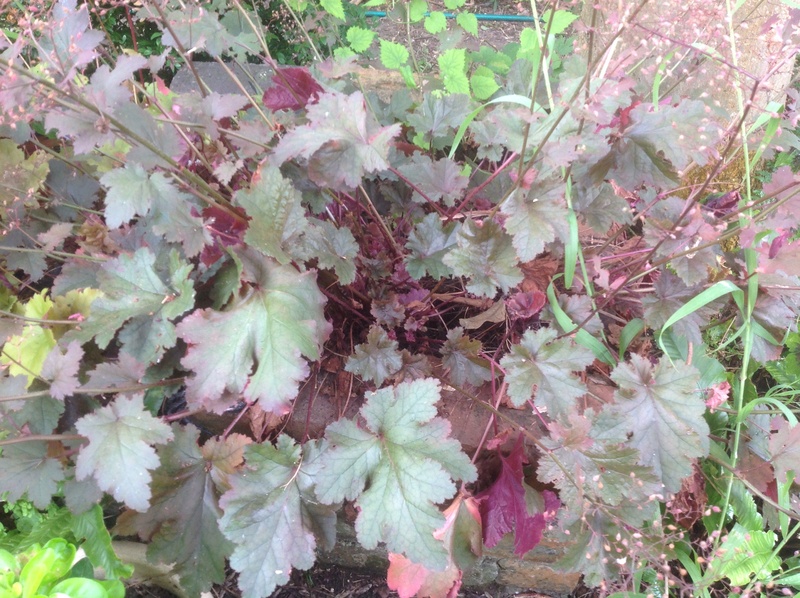 What could be better than Heuchera “Chocolate Ruffles”! 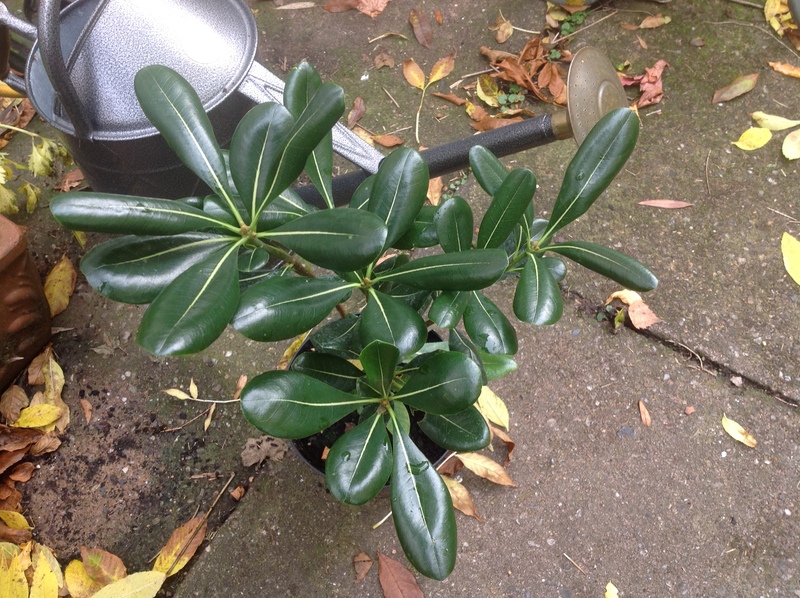 A great edging plant with evergreen, chocolate brown leaves (somewhat paler at this time of year, in this photo). 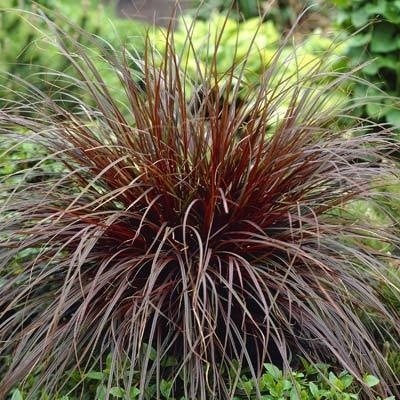 And, to provide a contrast in texture, we could do with a chocolate coloured grass, so this sedge fits the bill! What a yummy collection for all us chocolate lovers! As I said, this was a bit of fun, but I think it would work in practice. It would need a sunny site with free draining soil, although the sedge grass may need extra watering. Although shade lovers normally, Heucheras and this foxglove both like sunny conditions as well. The flaw, if it is one, is that the flowers don’t bloom at the same time, but the foliage should pull it all together. Hope you like my Chocolate Pot! If you have any other suggestions for a theme, please let me know, and I’ll see what I can concoct! 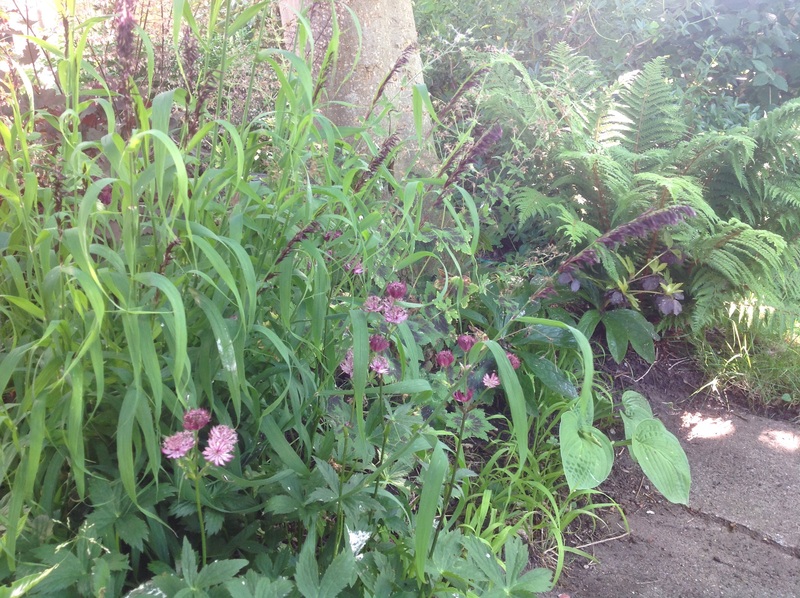 This entry was posted in Garden Design and tagged Akebia, Chocolate, Cotinus, Digitalis, Helenium, Heuchera, Iris, Uncinia on August 10, 2014 by thelonggardenpath.